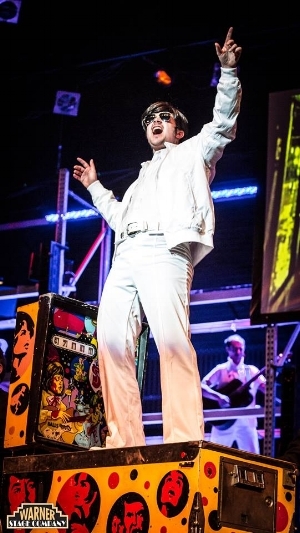 Torrington, CT - ‘The Who’s Tommy’ is a rock musical based upon the 1969 rock concept album ‘Tommy.’ that blasts through the story of the boy that is struck deaf, dumb and blind after a traumatic experience as a young child and goes on to become a pinball superstar. The music of The Who punctuates both the trauma and the healing that Tommy experiences and takes the audience on a sensational journey. Sharon A. Wilcox directed and choreographed the spectacular production that opened to a crowded house on the main stage of Torrington’s Warner Theatre on Saturday night and runs through Feb. 12. This actually marks the second time that Ms. Wilcox has had the opportunity to direct this musical that she first saw on Broadway, and the second time that the dedicated Dan Ringuette served as the music director. I did not get to experience that first production, but this season’s version is a powerful, non-stop sensation that we see, hear and feel. If the story is a little bizarre, the music of Pete Townshend is the driving force that makes this a truly modern rock opera and the opening night audience loved every minute. It was exciting to see a production of ‘Tommy’ that was so big that it filled the huge Warner stage with singing and dancing by this talented cast. The lengthy prologue done mostly in pantomime sets the tone, and the second act begins just as strong with an underture and afterture. Some of the torment that Tommy endured seemed toned down but Rob Richnavsky was brought in for some fight choreography. I found the staging of some of the bigger numbers like “Christmas” and “Sensation” to be very inspired and the choreography was never too much. Assistant director Steve Houk designed the brilliant set that put the band members onstage in Hollywood Squares-like boxes; dressed in all white, they rightly became a part of the show. This was a reunion of the members of the band Arsenal from ‘Rock of Ages.’ Now renamed ‘Tilt,’ they included Mr. Ringuette on keyboard 1 as well as the conductor on video screens, Paul Tine on keyboard 2, Chris King on keyboard 3, Mark Garthwait on guitar 1, Meric Martin shredding keyboard 2, Dan Porri on bass, Nate Dobas on drums and Dan Borgman on the requisite french horn. These guys never stopped playing, almost making it all feel like a rock concert with very impressive visuals. LBC lighting designed the extensive lighting that included strobes; be forewarned that there is also haze and fog effects and simulated gunfire. Projections and even live video by Katherine Ray and Ms. Wilcox effectively set the scenes and the busy running crew had very little time to get the mirrors where they needed to be. The outstanding costumes by co-costumers Renee C. Purdy and Aurora Montenero effortlessly brought us back to the forties, fifties and sixties with fine wigs by Marrianne Parks. My favorites were the jewel-toned suits for the two pinball lads (played by Michael L’Altrella and Tony Leone) and Cousin Kevin (Peter Bard) for the first act closing number “Pinball Wizard,” the outfit for Gypsy in “Acid Queen,” and the sixties garb for the final scenes. Dressed in white, fourth grade student Brendan Harris played Tommy at age 4, eighth grader Trevor Rinaldi became Tommy when he turned 10, and Noel Roberge (Drew in ‘Rock of Ages) was the adult Tommy (Narrator.) Mr. Rinaldi was scarily unresponsive until he got to sing and the talented Mr. Roberge gave a rocking performance. Other gentlemen in the cast that played local lads and security guards included Jonathan Zalaski, Christopher Franci, Joey Frighetto, Steffon Sampson, Shelby Davis, Rey Budny, and Tyler Bard in his Warner debut. The security guards and local lads in all black had some great dancing to do. Local lasses included Kaitlyn Anthony, Nicole Bard, Caitlin Barra, Katie Chamberlain, Malie Grasmere (the fabulous Snoopy in ‘Charlie Brown Christmas,) Lauren Jacob and Cassie Martin. Sara Carlin played Mrs. Simpson, Kevin’s mother and a nurse and Bronwyn Hamill, who was in the cast 12 years ago, played a specialist’s assistant, the minister’s wife, and a nurse. Ms. Jacob also played fan Sally Simpson wearing a great mod color-blocked dress and Ms. Chamberlain (Waitress #1 in ‘Rock of Ages’) wailed many a note as the Gypsy. Roxie Quinn was amazing in the role of Mrs. Walker; even when her mic went out in the first act, her strong voice managed to be heard. This production of what I think is a great show is impressive in every way and quite the immersive experience. Fans of The Who and classic rock in general can’t help but get swept up in the relentless music that only pauses for a bit of dialogue. Congratulations to Ms. Wilcox and the entire cast and crew on another blockbuster production at the Warner that is destined to become one of my top ten for the year. Nancy Sasso Janis is a member of the Connecticut Critics Circle and continues to contribute theatre news to local Patch sites. Check out her Facebook Page ‘Connecticut Theater Previews’ and follow her on Twitter @nancysjanis417.